Napa Valley Marathon Completed- Overcoming Adversity Two-Gether! 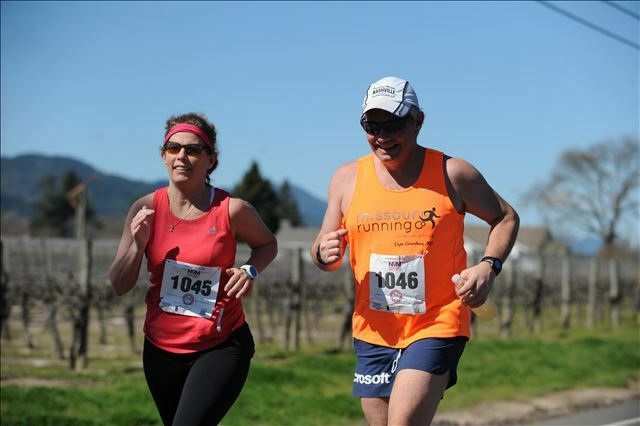 All of the support and publicity from Mark Winitz and the Napa Valley Marathon! – Thank you Mark! Spending time with my sister and brother in-law before the marathon at Hanna Winery- Thanks Ted at Hanna Winery for making our day a special day! Keeping warm on the bus and hoping that they don’t make us get off and stand in the cold for an hour- Thank you Napa Valley Marathon! Beautiful Scenery throughout the marathon course- We have never experienced such a beautiful course! The challenges put before us and the ability to figure out how to overcome them together! Having each other’s support the entire way! Great fueling stations- especially the sorbet- Thanks to Oak Knoll Inn! Realizing at mile 23 that I had not thought about missing my music the entire marathon until David said something about headphones. I looked at him and laughed and said “I did not even think about this the entire race- is that not crazy?” I guess my mind had other things to worry about! Wearing our medals to the wineries after the marathon and sharing our stories with others! Once Again, Crossing the Finish Line Holding Hands TWO-GETHER!